Alibaba's Ant Financial Services has introduced a trial payment system based on facial recognition — just smile to pay. 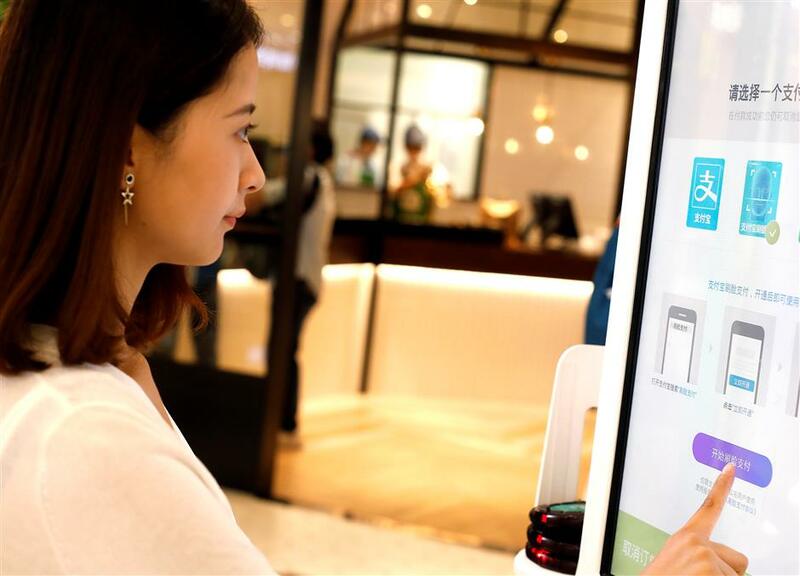 Alibaba’s Ant Financial Services Group launched world’s first face-recognition online payment system in Hangzhou last week. The new technology is expected to spread across more outlets, which means that people can pay without a smart phone. The system is being tested at a restaurant in Qianjiang New Town. Diners browse on the screen, tap choices, and then use the screen to pay. The scanning system focuses on face, and it doesn’t matter if you change your makeup or hair — or even put on a wig. “Combined with a 3D camera and a liveness detection algorithm, the system can effectively block spoofing attempts using other people’s photos or video recordings and ensure account safety,” Chen Jidong, Ant’s director of biometric identification technology, said in a statement. A customer makes a mobile payment at the restaurant KPRO, where the face-recognition online payment system is available. Today, many Hangzhou residents go out without cash, because they can pay with phone instead — scanning a QR code to use Alipay or WeChat. According to statistics, Chinese consumers already lead the world in paying with their phones, with more than 450 million users doing it this year. Now the new system is expected to make online payment even easier. Chen said it could be used in more fields to make life more convenient. The firm describes facial recognition as “smile to pay.” It is attached to Alipay, the most popular third-party online payment application in China. Users just activate the function on the app and then smile to pay at the available restaurant. The restaurant, called KPRO, offers seasonal produce, made-to-order salads and paninis. Drinks include freshly squeezed juices, gourmet coffees and craft beer. In addition to online payment, more and more restaurants are cashing in on technology to reduce labor costs and save time. Some even use robot waiters. Hangzhou Sheng Hua Yuan Restaurant spent 140,000 yuan (US$21,421) buying two robots to serve the dishes at the eatery. In Huahua Sister-Parent Restaurant, two robots welcome diners at the door and recognize customers by scanning their face. They introduce the restaurant to consumers and help them order their meal. During the beginning of every Chinese Lunar New Year, many restaurants lack waiters because most migrant workers go back to their hometown. Such robots could relieve that shortage. Zhejiang Gongshang University replaces humans with robots in making noodles. Daoxiao noodles are short, thick and irregularly shaped as they are cut from the dough with a knife and added into the soup. The robot can cut dough more effectively than humans. Just input the wanted size for the noodles, and it immediately starts cutting precisely. The cafeteria can now cook on average 10 more bowls a minute and save more than 50,000 yuan a year. The digital age is not only changing our traditional shopping and service patterns, but also brings cyber power to traditional food markets. At Yuniao supermarket, consumers can scan the QR code on vegetables and find out instantly where it was grown, when it was picked and how much pesticide was used. Consumer data can be captured by the software and then the volume of crops needed to meet market demand are calculated. That reduces waste and raises production value. Meanwhile, it provides data on humidity, sunshine and temperature to farmers, helping them monitor these factors. The development of Hangzhou’s smart technology industry is attributed to local government. It has created No. 1 Project, which has two prongs — developing information technology and promoting smart applications. Smart technology is changing traditional industries. Selling and products and ordering food online are just two aspects of how innovation is now altering our lifestyles.